Nothing epitomizes the precarious nature of the planet for me, then the view as you fly from the high mountain plateaus of the Altiplano towards the El Alto airport and see spread out in front of you the immense sprawling valley where the city of La Paz is perilously situated. The image of a vastness of crowded slum communities perched on the high reaches of the escarpment and spilling down into the steep, treeless, ravines and gorges of the valley are breath taking. The Anthropocene, a human imprint at a global-scale. A fragility of children and their nonhuman companions engaged in a dance of daily survival with shared vulnerability. The unsettling that the naming of the Anthropocene has administered – and will continue to administer – is a massive jolt to our collective imagination of ourselves. the irony we as a species, amongst others, find ourselves: both as the monster and maker. The concept of the Anthropocene assumes a generalized anthropos, whereby all humans and nonhumans are equally implicated and all equally affected. Through my research I seek to bring attention to the way the environmental crisis accentuates rather than diminishes differences between the privileged and the not so privileged. Because we are not all in the Anthropocene together, the children are far more in it than others. Wealthy humans have cultivated a global landscape of inequality in which they find their advantages multiplied in these highly fragile times. Philosophically, it is a concept that works both for us and on us. In its unsettlement of the entrenched binaries of modernity (nature/culture; object /subject), and its provocative alienation of familiar anthropocentric scales and times, it opens up a number of possibilities for exploring concepts such as assemblages, relations and kin. The research project Children in the Anthropocene is premised on the import of making kin, the ‘situatedness’ of being child relative to, and combined with ‘other’ kin. That we are all beings in common, entangled, sharing ecologically our posthumanist selves. Throughout the past 20 years I have listened intently to children’s stories by noticing and paying attention to their experiences of growing up in relation with others (human and non-human). The research was both ethnographic and participatory in its methodology. To be responsive, place-based participatory research engaged by the researcher with children is attentive to noticing the fine grain differences and similarities, it seeks to encourage complexity rather than simplicity. When engaging with children in precarious environments this responsiveness supports opportunities for children from a variety of ages and genders, diverse lives, interests and experiences to take up and make choices of their responses to the possibilities that exist to engage with the research. Children I researched with on the higher reaches of the valley of La Paz were aged between 5 and 15 years old. They volunteered to be co-researchers using visual, oral and mobile place-based research activities including photography, interviews, focus groups, drawings, mapping and walking interviews. The project focused on incorporating a research perspective through their everyday experiences of being curious, creative and playful in their place so supporting a range of possibilities for children to document relational encounters. For some communities in La Paz the children’s research workshop included opportunities for families to be involved. Parents or grandparents, brothers, sisters, cousins especially in the beginning, came along to watch, ask questions and even help out. Ethical considerations of negotiating children involvement meant working in outreach children’s centres in the community where months in advance social work students had provided information workshops and small meetings for children and their parents. As a feminist onto-ethnographer, I have also inserted myself in the research studies by documenting my experiences through a field diary, photographs and videos. Theoretically, I have adopted an onto-epistemological research stance that assumes epistemology and ontology are mutually implicated ‘because we are of the world’, not standing outside of it. The theory of ecological posthumanism I have adopted contests the arrogance of anthropocentric/humanistic approaches, by enabling a multiplicity of ecologies where humans are neither exempt or exceptional, we are all beings in common. By adopting a stance of vital new materiality, I have sought to acknowledge the aliveness of matter; that it is always more than mere matter: it is active, self-creative, productive, unpredictable. I have employed the theoretical device of ‘intra-action’ and ‘diffraction’ as used in new rmaterialism to support the documenting of the messy, heterogeneous relations between children and their nonhuman world. By enacting a posthumanist and new materialist reading of the Children in Anthropocene project, I have shifted away from the child as the central object of my gaze. I am being attentive to and noticing the non-human entities through which the children’s world is being encountered, where relational entanglement with material matter feels, converses, suffers, desires, yearns and remembers. I am attuning to matter, where all of it matters. It matters what knots knot knots, what thoughts think thoughts, what ties tie ties. We have much to learn from children about their everyday encounters with the humans and nonhumans they co-inhabit cities with. Emerging as an assemblage of naturecultures their stories are stories that matter, they are located at a range of times, enmeshed in complex spaces and are deeply vital at a molecular level. By sharing an imagined future, that supports an ecological posthumanist collective and senses the value of considering others as kin and beings in common, children have much to contribute in our shared stories of the Anthropocene. After all they have the most to lose, if we do nothing. Haraway, D 2011, SF: science fiction, speculative fabulation, string figures, so far’, viewed 30 January 2014, <http://people.ucsc.edu/~haraway/Files/PilgrimAcceptanceHaraway.pdf&gt;. Cities are central sites for reconfiguring, reimagining human-nature encounters in the Anthropocene. The city constitutes a powerful imaginary of the human-nature disconnect and therefore brings credence and attention to our seemingly de-natured lives. Cities represent the effects of the human dominance over ‘nature’; humans in control, taming and managing the wildness of the natural world. Keeping nature out. Earlier in my research I remember writing about ‘urban sustainability’ as having the potential to disrupt the nature-culture divide, by offering up visions of a ‘balance’, how humans and non-humans could co-exist in eco/green/biophilic/cities. Guided by theories of biophilia, my designs of an imagined eco-green cities were based on the hypothesis that humans (and particularly children) possessed an innate desire to seek close relations with nature and other forms of life, and if only we could ‘let’ nature back into cities we could nurture this desire. Humans, (especially children) in this biophilic world, could be re-constituted, re-inserted with and re-embedded as a significant other in the natural world. Biophilic cities would be abundant with ‘nature’; cities could be places where humans nurtured protected, restored and grew nature. Children could play, find refuge and develop kin relations. They would look different; the presence of an abundance of plants, would foster deep connections and daily contact between the humans and the non-human world. Such aspirations of a natured urban sustainability have been increasingly augmented, or framed within neo-liberal agenda of sustainability, by notions of ‘resilient cities’ ‘livable cities’, ‘healthy cities’, ‘sustainable cities’ and claimed through human ingenuity ‘human smartness’, in which human agency became at best assertive, reactive, or even dissolved within a process of recursive co-adaptation. My growing suspicion of the restorative value of this anthropocentric environmentalism informing an urban sustainability movement (of which biophilic theories were deeply located) was based on its seemingly limited and narrow conception that nature was (only) of value because of its ‘material and commodity benefits’ for humans (Kellert & Wilson 1993). And we ‘humans’ although valuing the potential of nature for our own health and longevity as a species, weren’t nature. Around the world big actions, by corporate companies to build shining examples of ‘green’ skyscrapers in high income nations didn’t fit well with my experiences of children thrown-together in the messy, dirty and untamed environments of slums. The places where we know the majority of the world actually resides. To respond to the big picture challenges of sustainability… twenty-first century children need relational and collective dispositions, not individualistic ones, to equip them to live within the kind of world they have inherited …They will need a firm sense of shared belonging and shared responsibility … They will need to build upon a foundational sense of connectivity to this same natureculture collective (Taylor 2013, p.118). The children in the neighbourhoods high on the El Alto have tremendous views across the valley all the way to Mount Illimani. Mount Illimani is the highest mountain in the Cordillera Real, a sub range of the Andes and stands at 6,438 metres above sea level. It lays south of La Paz at the eastern edge of the Altiplano. With its snowed capped summit visible from across the city of La Paz it acts as a significant landmark and its connection to the lives of the inhabitants of the city and the surrounding countryside is deeply entrenched in Bolivian heritage and culture. Bolivia is a landlocked country separated from the Pacific Ocean by Chile. Bolivia had a coastline, but its former coastline is now Chilean territory. The Bolivian terrain includes the rugged Andes Mountains that includes a highland plateau where La Paz and Lake Titicaca (the world’s highest navigable lake) are located. There are also the rolling hills, large expansive rivers that flow into the lowland plains of the Amazon Basin. Some of the major environmental issues for the country include the clearing of land for agricultural purposes and international demand for tropical timber, both of which are contributing to deforestation, soil erosion, desertification, loss of biodiversity, and industrial pollution of water supplies used for drinking and irrigation. The city of La Paz is located in west-central Bolivia, 42 miles (68km) southeast of Lake Titicaca and is at an elevation of between 10,650 and 13,250 feet (3250 and 4100 metres) above sea level. This makes it the highest national capital city in the world. 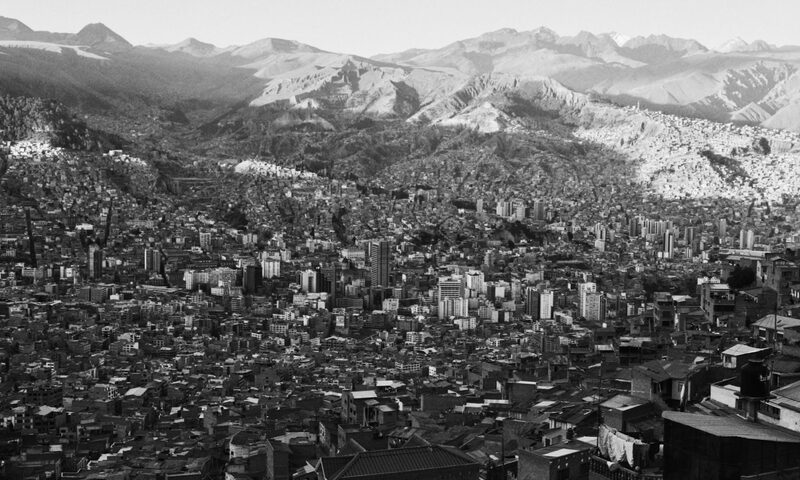 La Paz is near the famous mountains including the Illimani (guardian of La Paz), Huayna Potosi, Mururata, and Illampu. On the western side of the Altiplano divide, about an hour to the west of the La Paz, is the site of the tallest mountain in Bolivia and ninth tallest mountain in the Andes, the Sajama Volcano. The Pachamama influences children’s worldview in La Paz, it is one where the earth deserves and is provided with the same ethical and political considerations as humans. Children’s encounters with the shared ecologies of the mountain are central to their stories of living and being with other entities in the city. The majority of children of the slums of La Paz although living in a very altered environment were deeply embedded in the potential of intra-acting with the natural environment. This was not an imagined romantic nature, a wooded forest with birds and butterflies; but a difficult, dirty, gritty world of living with others through shared material matter. For the boys especially, adventures into the hill top forests are an important part of their play activities even though it can be dangerous. Girls have less freedom and tend to be limited to engaging with the trees in gardens close to their homes. The shared encounters of Mount Illimani and its impact on all children’s sense of connection to place are very unique. This aesthetic openness to the mountains, the clouds, the weather drew them into a oneness, yet it wasn’t a sense of wonder of nature as ‘extraordinary’, is was of being one with the world, being entangled in shared ecologies of the everyday. The image is from Fernando aged 11 from Munaypata. He describes his drawing to me: ‘I like to see my area green. I am inside in this picture. I don’t go out by myself. I go out on weekends. I like to walk. I don’t like cars. I like everything that is natural. I like rainbows, when I went to Copacabana I liked seeing rainbows. I like walking through the woods because it is like a jungle’. Children in La Paz are deeply entangled in a relation with their natural world. This is not just a worldly present relation but a deeply entrenched history of reverence and respect for nature and the earth that has evolved through their indigenous spiritual beliefs of the Pachamama. (Pachma meaning ‘cosmos’ and mama meaning ‘mother’). In the indigenous philosophy of the Andean people, the Pachamama is a goddess. She is Mother Earth. She sustains life on earth. Water, Earth, Sun, and Moon are Mother Earth’s four Quechuan cosmological entities. When I was staying in La Paz the local newspaper had a quote from the Foreign Minister about the new law on the rights of Mother Nature. I asked my colleague to translate. Our grandparents taught us that we belong to a big family of plants and animals. We believe that everything in the planet forms part of a big family. We indigenous people can contribute to solving the energy, climate, food and financial crises with our values. Bolivia has passed the world’s first law to grant eleven new rights for nature. Mother Earth is described in the law as ‘a dynamic living system comprising an indivisible community of all living systems and living organisms, interrelated, interdependent and complementary, which share a common destiny’ (Bolivian Legislative Assembly 2011, p.2). The Law of the rights of Mother Earth includes the right to life and to exist; the right to continue vital cycles and processes free from human alteration; the right to pure water and clean air; the right to balance; the right not to be polluted; and the right to not have cellular structure modified or genetically altered. Controversially, it will also enshrine the right of nature to not be affected by mega-infrastructure and development projects that affect the balance of ecosystems and the local inhabitant communities (Bolivian Legislative Assembly 2011). Bolivia will struggle, like many countries, to cope with rising temperatures, melting glaciers and more extreme weather events including more frequent floods, droughts, frosts and mudslides, that are often outside of their control. The steady rising of temperatures we are experiencing now (which has no borders) and which continues to accelerate could turn much of Bolivia into a desert. Glaciers in Bolivia below 5,000m, for example, are expected to disappear by 2030, leaving Bolivia with a much smaller ice cap. Scientists say this will lead to a crisis in farming and water shortages in cities such as La Paz and El Alto. Children’s encounters and relations with the environment influence their lives. They are central to their stories of living and being in their cities. The majority of children growing up in the slums of La Paz although in a built very altered environment were deeply embedded in the potential of intra-acting with the natural environment. The encounters with Mount Illimani and its impact on their sense of connection to place are very unique. Children shared photographs from their viewing point, a place where they would go to be with the mountain, especially at sunset. I sense they know the mountain as kin, as part of their being child in this collective of eclectic ecologies. In the practices of walking with children within these entangled worlds, we notice and attune to the damaged landscapes of the Anthropocene. …learning through encounters with other species is not always harmonious and pleasant, is not always equal, and does not offer us “moral certitudes or simple escape routes” from the mess we are in (p. 20). The potential to extend ‘ecology’ beyond a hierarchical anthropomorphic structure to “uncover a whole world of resonances and resemblances” (Bennett 2010: 113). This opening up (beyond anthropomorphism) allows opportunities for the nature/culture divide to be reconsidered as ‘ecological collective’ – containing active agents of human and nonhuman elements. For educators, it allows openings for posthuman pedagogies that consider relations between material objects to be reassigned as a ‘vital (vibrant) kinship’ between the human and nonhuman (Bennett 2010). Such an approach therefore may lay the foundations for a recasting of learning about sustainability. For others involved in city planning or childhood support services, it encourages them to be attentive to, notice and acknowledge rather than dismiss the means through which children are encountering nature in their everyday lives. Supporting difference and complexity within child-nature relations by supporting a posthumanist approach to addressing the challenges of the Anthropocene, I have argued in my recent work on Children in the Anthropocene is central to supporting posthumanist ecological communities. Bennett, J. 2010, Vibrant matter. A political ecology of things, Duke University Press, Durham. Bolivian [Plurinational] Legislative Assembly 2011, The Act of the rights of Mother Earth, viewed 3 May 2016, . Chandler, D. 2013, The World of Attachment? The Post-humanist Challenge to Freedom and Necessity, Millennium – Journal of International Studies, 41, 3, 516-534. Kellert, S & Wilson, E.O. (eds)1993, The Biophilia Hypothesis, Island Press: Washington. Taylor, A. 2013. Reconfiguring the natures of childhood. Oxon & London: Routledge. Taylor, A & Pacini-Ketchabaw, V. 2015, Learning with children, ants, and worms in the Anthropocene: towards a common world pedagogy of multispecies vulnerability, Pedagogy, Culture & Society, vol. 23, no. 4, pp. 507-529, doi: 10.1080/14681366.2015.1039050. This blog post is an extract from the chapter Ecologies: Entangled Nature from my current Palgrave book: Children in the Anthropocene: Rethinking Sustainability and the Child Friendliness of Cities.